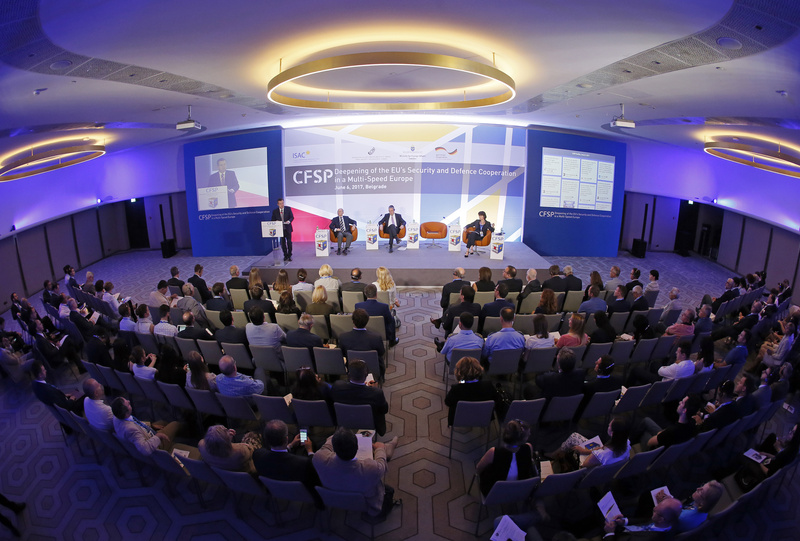 We are happy to announce the successful conclusion of our 3rd CFSP conference, “Deepening of the EU’s Security and Defence Cooperation in a Multi-Speed Europe” held at the Hotel Crowne Plaza in Belgrade on June 6, 2017. The day’s schedule included four different panels that discussed security and defence cooperation in the European Union and its implications for Serbia and the Western Balkans. The first panel featured a discussion with Nenad Šebek, Director of Heinrich Böll Stiftung’s Belgrade Office, Lars-Erik Lundin, Distinguished Associate Fellow of the Stockholm International Peace Research Institute, Daniel Fiott, Security and Defence Editor at the European Union Institute for Security Studies, and Jiřί Schneider, Executive Director of the Aspen Istitute about how to deepen security and defence cooperation in Europe. The panelists agreed that recent nationalistic events such as Brexit and Trump, along with the increased threat of terrorism, may actually motivate a new era of progress in European cooperation. The panel also stressed the need to encourage basic European solidarity behind common threats and to strengthen regional cooperation in the Western Balkans, but they disagreed on whether or not Europe, in its current state, is up to the task of creating strong security and defence. The second session featured keynote speeches by three distinguished guests. First, Ivica Dačić, Acting Prime Minister and Minister of Foreign Affairs of the Republic of Serbia, emphasized Serbia’s commitment to European values and further integration with the European Union, but he also called on the EU to invest more effort into understanding Serbia’s position on Kosovo and Metohija and to respect Serbia’s contributions to peacekeeping operations. Markus Ederer, State Secretary of the Federal Foreign Office of Germany, stressed that certain requirements need to be met to join the EU, and that it should not be thought of as a negotiation. At the same time, he said that Serbia should be given the autonomy to forge its own path and choose its own allies. Finally, Angelina Eichhorst, Director for Western Europe, Western Balkans and Turkey of the European External Action Service, expressed that Serbia is part of a larger European family and hopes that the decades of the EU’s progress and peace can be repeated for the Western Balkans. The third panel with Tanja Miščević, Head of the Negotiating Team for the Accession of the Republic of Serbia to the European Union, Vladimir Ateljević, Senior Advisor to the Minister without portfolio responsible for EU integration, Eduard Auer, Head of the Western Balkans Division at the European External Action Service, and Amer Kapetanović, Assistant Minister of Foreign Affairs for Bilateral Affairs and Economic Diplomacy for Bosnia and Herzegovina, dealt more specifically with regional politics in the Western Balkans. The guests discussed how the region can better align with the obligations derived from Chapter 31 and praised the increased cooperation between Bosnia and Herzegovina and Serbia. The final panel, moderated by ISAC’s Program Manager Natan Albahari, featured Lars-Erik Lundin and Eduard Auer returning to address a crowd of emerging young leaders. The panel discussed what today’s youth can do to prepare for political careers and what EU politics is really like behind the scenes. We are glad to have had the opportunity to bring together various stakeholders and senior representatives of the EU, Germany and Serbia, and enable a further exchange of views, messages and advice on how to best move forward when it comes to Serbia’s European path and harmonizing its foreign and security policy. At the same time, we were able to bring closer to the Serbian public what further security and defence cooperation means for not only the EU, but for those Western Balkan states which will in the near future also become members of the EU. In the next period we will be publishing several papers and conclusions from this conference, which you will be able to find on our web site and Facebook page. You can also find the recordings of the conference on our Facebook that were part of our live feed. Finally, we would like to once again thank all the speakers, participants and volunteers who have helped make this conference a big success, and especially our partners – the German Ministry of Foreign Affairs, the Swedish Ministry of Foreign Affairs and the Fund for Open Society.